Are you already thinking of holiday gifts to buy to moms, dads, or spouses? Do you find it difficult to come up with ideas especially for those who have everything? Funny enough, I always find it tough thinking about men’s gift but was able to come up with more ideas for men even before figuring out ideas for ladies. But I did put together ideas each for both men and women that I think any dad, mom, spouse or men and women in general would love. 1. Handbags or Purses – Cute handbags are mom’s thing!! By now, the kids or spouse should already know mom’s style and could find her a nice bag to match her style. 2. Jewelry – I’ve never met a women who didn’t love a piece of jewelry. This rose gold necklace is pretty and would make a lovely gift. I linked a bunch of rose gold necklaces that I think a mom or spouse would love. 3. 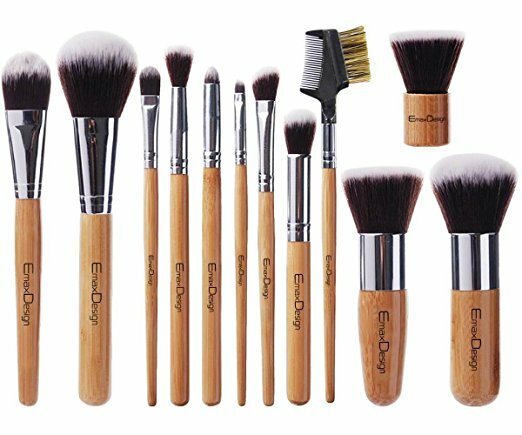 Make-Up Brushes – I love the wooden Eco-Friendly wooden brushes. This looks like a really cool set. I think all women who loves make-up would rather choose their own but it could be easier to do once the kids or spouse knows what she likes. But when in doubt, maybe a set of brushes might be a better option. 4. Fuzzy Slippers – Moms and homemakers are always running around trying to keep house and sometimes don’t take the time to rest their feet. Why not get mom or spouse a fuzzy pair of slippers to help keep her feet comfortable? These pink fuzzy booties look so soft!! 5. Spa Kit – Time to relax with this lavender and essential oil blend of spa body set. Sometimes just a few minutes of quiet just to soak in the tub is good for the body. After all, we’re always in a hurry to help everyone else – encourage self care with a good spa kit. 6. Gift Cards – Gift cards are always welcome. Dad can watch the kids while mom goes out to get a beauty pampering at a spa, nail art works, hair salon or something of that nature. Another great idea is a gift card to one of her favorite places to shop. 7. Mug – I think this one is funny but it holds a lot of meaning to it. It goes back to my point about taking time to soak in the tub with good spa essentials. The longing for 5 minutes of peace and quiet, this mug says it all! 8. Book – I have this book and it is such an encouragement to me. It’s a very easy read – one and a half to two pages per topic. The author will give a verse then talk of an example from her own life, then share how she applied this verse to her situation and we can apply it to our lives too. I typically read only one lesson for a day. It’s a wonderful, wonderful little book! 9. Water Bottle – Having a water bottle is one of the best ideas to help you to drink more water. Many times I drink more water when my water bottle is filled rather than having to fill and refill a cup all the time. 10. Pajamas – I love a good pair of pajamas but I find that they require some searching to find the right ones. I have gotten pajamas for gifts and sure did love them. 1. Watch – I love seeing my husband wearing a watch – it just seems to complete his outfit. Watches make great gifts (both for men and women) and I think any dad or spouse would love a good watch. Once you know their style, it will be easier to find a good one they would like. 2. Cologne – Colognes make great gifts for men but it’s helpful to know what smell they like before purchasing. There is no point of picking something in hopes they would like it. I linked a few. Find them by clicking on the cologne image. 3. Wallet – Is your spouse’s wallet falling apart? Why not get them a new one? Find a well-made leather one that they’d appreciate. 4. Grooming Kit – I think a guy would appreciate a grooming kit! This one is compact enough for traveling too. 5. Beard Care – Men pride themselves on their beard whether they are long, short, or scruffily!! A good beard care kit would make a wonderful gift!! I love, love what’s in this kit – the little brush is too cute too!! 6. Cozy Slippers – Like moms, dad can benefit from cozy slippers too. These look really great and would be a gift a dad or spouse would love. 7. Pajamas – From cozy slippers to cozy PJs, yes! Plaid pajamas are awesome for men. It would be fun to pair them with a pair of cozy slippers too!! 8. BBQ Grill Set – Because men love to grill and I think they would love to know we support them in what they cook with a grilling tool set. 9. Compact Coffee Maker – If your husband or dad or any other men in your life has their own office space, a small coffee maker would be a nice addition to it. They could brew their own coffee from their office instead of having to head in the main lobby to brew coffee when they need some. Don’t forget to complete the gift with coffee, filters and a fun mug. 10. Gift Card – What kind of outdoor activity does he enjoy? Why not gift him with a gift card to his favorite place for a day out? Hopefully, these gave you some ideas for to gift to the dads, husbands or men in your life. Do you see anything on this list you have not thought about but may be interested in adding to your gift list for your spouse or dads? What other gift ideas do you have from your own list?